Footage showing a chief in Edo State being booed out of the palace of the Oba of Benin for insubordination has been trending online. Chuks Mgborie Chukwu took to Facebook to share a story about a chief in Edo State, Chief Dr Ogiugo who was disgraced out of the palace because he refused to pay homage to the king. 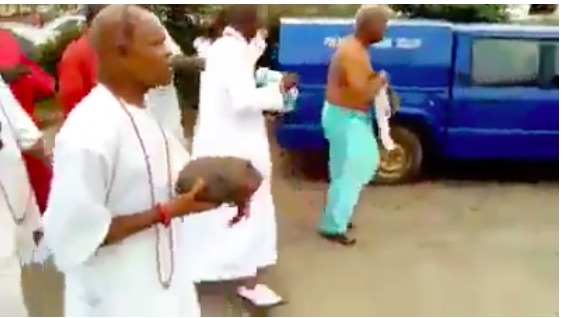 According to Chukwu, Oba Eheneden Erediauwa, placed a curse on the stubborn chief for the sacrilegious act. He then banished him from the state, and ordered all indigenes of Edo State to disassociate themselves from him. Edo Kingdom:This is Chief Dr. Ogiugo. Because he did not pay homage to the Oba of Benin, he was cursed two days ago in the Oba of Benin palace and labelled the enemy of the palace from that day on, and decree was passed that nobody should have anything to do with him again.